My favorite part is the live demonstration at 0:16. Who knew the soft-spoken Conley could rock out to some Bon Jovi? Was he even born when that song came out?? Last few weeks a lot of folks have been talking about a new Twitterer named Shaquille O'Neal and speculating whether he was the real deal. It was pretty realistic, but, come on, Shaq isn't really Twittering, right? Well, turns out it wasn't really Shaq. 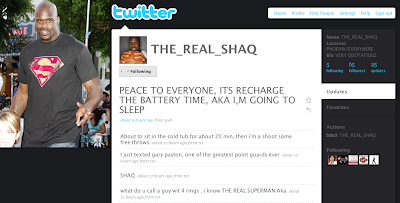 But Shaq found out about the fake guy and got so ticked he figured he better start Twittering himself. I just got a call from one of Shaq's people and THE_REAL_SHAQ is now Twittering. For real, for real. As of 9:30am Pacific, he only has 65 followers. Come on blogosphere, step up your Twitter game and let's get THE_REAL_SHAQ to at least 1,000 by the end of the day. By the way, I just started a fake Twitter account for Rasheed Wallace.... Muahahahahaha!! I was lucky enough to spend a little time hanging out and shooting video with the incomparable Sheed the other day. Big, big ups to my dear friend Matt Watson of Detroit Bad Boys fame for giving me the idea of asking him to explain his new tattoo. Sheed just posted our segment about that on his Yardbarker blog. TNT ain't got all that! 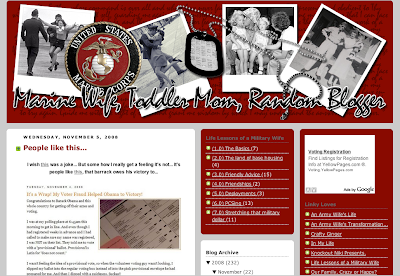 Stay tuned to his blog for more to come. I eat pizza better than Dewey. That's really all I have to say about it. If you don't know, you better ask somebody. Unfortunate opening camera angle brought to you by ibeatyou.com. T.J. Ford is a man of leisure, he needs none of your overly anxious high-fiving, Jeff Foster! Awesome analog-quality video brought to you by my dear friend getBuckets, who was drunk enough to find the funny part of the game recap, but not disciplined enough to sit there and rip it. Since she screenshot my blog, I'm going to screenshot her blog screenshotting my blog. META COOL! "People like this" need to catch a sense of humor (voting fraud is funny!!) and jump on the Obama Express. I'm not mad at you though -- hey, we had common ground in our opposition of Califorina's Proposition 8, which is going to ban gay marriage. And I like your well designed header. See, can't we just get along, WifeMomBlogger? It's a Wrap! My Voter Fraud Helped Obama to Victory! Congratulations to Barack Obama and this whole country for getting off their azzes and voting. I was at my polling place at 6:45am this morning to get in line. And even though I had registered weeks in advance and I had called to make sure my name was registered, I was NOT on their list. They told me to vote with a "provisional" ballot. Provisional is Latin for "does not count." I wasn't feeling the idea of a provisional vote, so when the volunteer voting guy wasn't looking, I slipped my ballot into the regular voting box instead of into the pink provisional envelope he had prepared for me. And then I dipped with a quickness. Suckas!! Voter fraud is EZ like Sunday morning. After my success at my home polling place, I went to four others in my county and did the same thing before rolling into work at 10:30am and complaining about how there had been "a long line." I guess it was "wrong," but it was for a good cause. And if they really want to prevent fraud, maybe instead of manning polling places with teenagers and elderly retirees they should call in the Coast Guard or some Chinese Olympic performers or someone who knows how to run a tight operation. 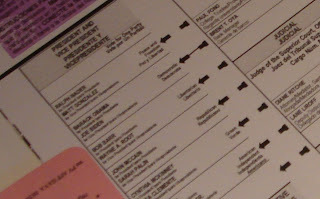 One of the old-school ballots I cast is pictured above. I wish I had also taken a picture of one of the adorable low-tech cardboard privacy booths. But you'll get the same idea from this video of Atlanta Hawks point guard Acie Law, voting in Georgia circa 1968. UPDATE: At least one person has taken me seriously, awesome! I hope she doesn't click on the other posts in the "MY FELONIES" tag. MLive is reporting that AI will be traded to the Pistons in exchange for Chauncey B-B-Billups and a pair of dice. I mean, Antonio McDyess. Big up to my homeboy Isaac for the heads up. Funny that the Answer is in the news because I finally settled on a Halloween costume at the eleventh hour Friday: Slutty Allen Iverson. You know, because I already had corn rows, an Iverson jersey, an elbow sleeve, and a closet full of mini skirts and high heels.